Hi everyone. More fun playing with Distress Oxides and stenciling. This is another card with layered stencils. 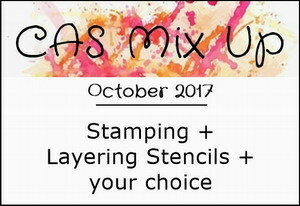 The CAS Mix Up challenge is open for a few more days. Hope you'll join us if you haven't already. I added a backing panel that was 1/2" longer so I could stamp my sentiment. This card was sent to a friend's husband who was in a terrible skiing accident. Wanted to let him know I was thinking of him. Thankfully his recovery has been going well. Love the extra detailing on the bird too x Makes him less flat!! Such a beautiful background and love the bird. Love, love, love your stencil layering, Loll! Totally adore the script on the bird too. Just perfect! More great stenciling Loll. Everything just marries together beautifully. The scripty bird really pops! I love the bird with the embossed script, Loll! He looks very classy on this stenciled background! Lovely card and what a sweet and thoughtful person you are. I'm sure he really appreciated your kindness and hope his recovery continues to go well. Hugs! Love this, Loll! Fabulous stencil layering and great use of the text on the bird to make him stand out more. Lovely masculine card, Loll! 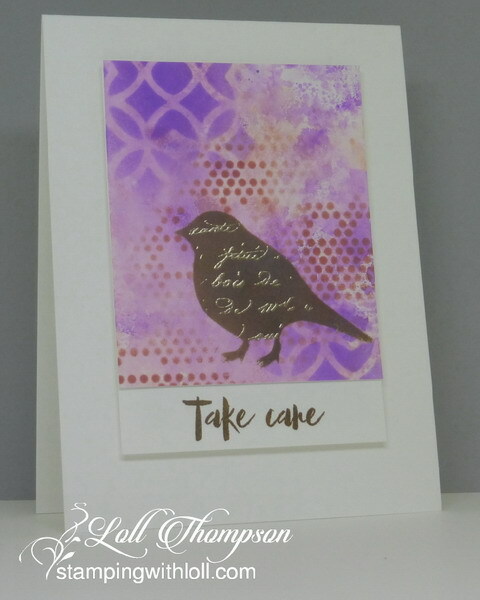 I love how you layered your stencils and the bird is beautiful! Your friend's husband is sure to appreciate your thoughtfulness! Great stencil layers, Loll. I hope your friend's husband is improving. A great mix of colors and stencils on your background Loll - great idea to add a piece on the bottom for the sentiment!